Pocket's Grille opened on September 16, 1996 in downtown Smithville, Texas with the strict objectives of delivering the highest quality service and the best tasting food in a clean casual enviornment. With hard work and dedication Pocket's Grille quickly became a local favorite. We believe that focusing on customer service and great food is what sets us aside from other local eating establishments and we continue to work hard to make Pocket's a place that Smithville can be proud of. 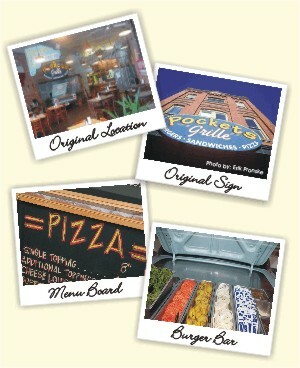 At Pocket's Grille you'll definitely find something to satisfy everyones appetite. We easily have the largest variety of food around. From burgers to pizzas to salads to sandwiches, we have it all. You'll also find some unique items on our menu such as our Fried Pickles, Firebites, Southwest Rollers and Sweet Potato Fries. All menu items are prepared fresh and made with the highest quality ingredients. All burgers are fresh, never frozen and our Dawgs are 100% beef franks. All salads are made with the freshest produce and leaf lettuce, no iceburg here. Our pizza dough is made from scratch everyday and hand-formed to order. Have you tried our "O" Rings? If not they are a must on your next visit. We hand-batter ever order along with our Mushroom Clouds and Fried Pickles. Getting hungry? In the summer of 2008, after 12 years, we moved off of Main Street and into our current location at the corner of Hwy 95 & Loop 230. Strict planning and design work went into making this the best dinning destination around. At Pocket's we not only believe that the food and service should be great, but we also believe that the atmosphere in which you dine should be enjoyable as well. With that said alot of effort was put into coming up with the right colors and textures for our new location. One of the best additions is our covered patio and outdoor stage. 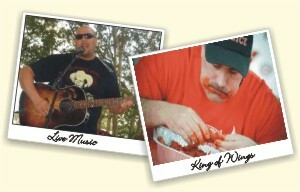 Along with music by local artists you'll also be able to check out events such as our annual King of Wings contest. And on the inside? Well, you'll still be able to find our chalk board menus and of course our custom '61 Ford Galaxy burger bar. We also added a large flat screen television to broadcast sporting events. Over the past couple of years Smithville has been busy hosting the film & music industries. Along with big budget productions such as Hope Floats and Tree Of Life there have been several smaller productions shot in town as well. Our town has also been the backdrop for music videos and in the fall of 2009 a national commercial spot for Valero Gas Company used Smithville as its location. 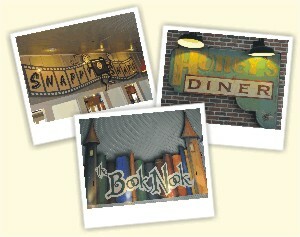 Throughout the years we have had the opportunity to meet many stars and crew members that have come through town. When you come into Pocket's take a second to look at all the things we've collected from them and now display on our walls. From movie props to signs and most notablby signed script cover pages from all the productions that have been through town.